MADISON SQUARE GARDEN, NEW YORK, 8 NOVIEMBRE 2009. Interpretación por primera vez del doble álbum The River en directo al completo, de inicio a fin. Grabado por John Cooper. Mezclado por Jon Altschiller. Sometime in the early 2000s, playing full albums in sequence, in concert came in vogue. 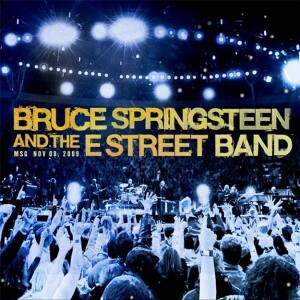 For the final leg of the 2009 Working On A Dream tour, Bruce Springsteen got in on the fun, announcing that for the band’s five-show stand at Giants Stadium, they would revisit a classic album each night, drawn from Born to Run, Darkness on the Edge of Town and Born in the U.S.A., after test-driving the concept with BTR at a show in Chicago. For fans, there’s a lot to like about a full-album performance. Hearing those songs in that order hearkens back to how many of us fell in love with the music in the first place, playing the albums over and over until we memorized every note and nuance. For Bruce and the band, it was something novel and different, too, shifting the approach to both the songs and sequencing within a concert dynamic. Case in point, “Badlands” and “Thunder Road” had evolved into key tracks used to wind down or close sets; in a full-album context they reverted to their roles as the starting point of the narrative. In a run of a dozen or so shows starting at Giants Stadium, Springsteen rotated the three albums into his sets, one each night. In truth, many of the songs were in regular rotation anyway (acknowledging outliers like “Meeting Across the River” and “Streets of Fire”), so the new experience was hearing the songs in order, presented as a whole. But when it was announced that Springsteen would return to Madison Square Garden and feature one-off, full-album performances of The Wild, The Innocent & the E Street Shuffle and The River, stakes were raised. Considerably. Both albums contain songs that were not part of the regular or even extended concert repertoire, plus a few that had barely made a set list in decades. The River is also a 20-song double album, so to perform it meant devoting nearly two hours of the show to that material alone. An ambitious prospect, and one that made this an unmissable night, because The River is just as much THE album that got many of us into Springsteen as Born to Run, Darkness and BIUSA are. The River performance at MSG holds its own today as much as it did in 2009, even given the 2016 River tour first leg which saw the album essayed every night. When Bruce and the band hit the road in January 2016 to start the new River tour in Pittsburgh, they were rehearsed and ready. In November 2009, a better operative word might be game. Firing in peak tour form, they were game to perform their most ambitious studio work as a special, one-time event. “It’s too long to do it again,” Bruce quipped at the time. For those lucky enough to be there (myself included), the result was a marvelous, in-the-moment experience for band and audience, as rarely played songs like “Crush On You,” “Stolen Car,” “Wreck On The Highway” “Fade Away,” “I Wanna Marry You” and “The Price You Pay” roared back to life, fulfilling long-held fan desires and restating the case for The River’s place in the core canon. It seems contradictory to feel heightened anticipation for a set where you know what 20 songs are about to be played, but there was an undeniable air of expectancy in the building as Springsteen took the stage for the opener, “Wrecking Ball,” which served to remind us Bruce had history with the building. Indeed, MSG was the site of four epic performances on the original River tour in 1980. From there we were off, galloping through both ends of the emotional spectrum with equal aplomb. Stalwarts like “The Ties That Bind” and “Out In the Street” felt freshened by renewed context, while Bruce made a delightful meal out of “Crush On You,” “a hidden masterpiece” only played once since 1980. The charm of mid-tempo romantic gems like “Fade Away” and “I Wanna Marry You” resonated and left one wondering why they lay dormant for so long. Part of the answer is the absence of Stevie Van Zandt from the two major tours that followed the album. His imprint on The River cannot be understated. Heard in the robust, up-close mix by Jon Altschiller, Van Zandt’s guitar playing (which on this night included 12-string electric) and vocals (backing harmonies and shared leads) are essential to this body of work. For many, “Stolen Car” was the moment they had been waiting for. With Max Weinberg, Garry Tallent, Charlie Giordano and Roy Bittan in particular providing a gorgeous accompaniment, Springsteen played one of his greatest and saddest songs with heart-wrenching austerity. The River’s high contrast is truly brought to bear in the sequence of “Stolen Car” into the hydraulic pounding of “Ramrod” followed by the exhilarating declaration of “The Price You Pay,” the latter another high point in the show. For its final act, The River winds down through the slow rising crescendo of devotion pledged in “Drive All Night” and, lastly, the stark humanity of “Wreck on the Highway.” On the 2016 tour, “Wreck” was given a more lush and full-bodied arrangement, ending the album sequence on a different note. The 2009 edition retains more of the somber majesty of the original and serves as a plaintive coda to the overall River story.